Dr. G.K. Bedi , M.B.B.S, M.D (Obstetrics & Gynaecology) is the Director & Infertility Specialist at Bedi Infertility Centre, Chandigarh. Dr. Bedi is a Post Graduate in Obstetrics & Gynaecology from Delhi. 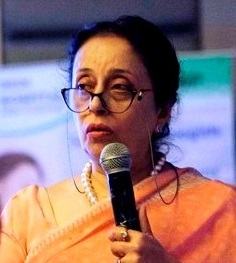 After having worked for 30 years in Obs & Gynae, she diversified herself into another sub-speciality i.e.Infertility. She has been in the field of Infertility for more than 18 years & has attained a high level of expertise & experience in this domain, having successfully conducted numerous IVF cycles, IUI, Laproscopic procedures with success rates matching international standards. She is now internationally recognized Infertility specialist and has conducted a number of infertility cases with the success rate matching the international standard i.e., 40%. To her credits, Dr. Bedi has treated patients from all over the world with remarkable success and is amongst the best Infertility Specialists & Gynaecologists of North India. Dr. G. K. Bedi being pioneer in the field of infertility treatment, regularly conducts seminars, workshops, CMEs, to hone her practical skills & knowledge and of other doctors of this region. Apart from this, her articles also feature in the leading newspapers & magazines of India. ***The funniest cry I have ever heard is that of my New Born. All Thanks to Dr. G.K. Bedi. She is utmost professional and a genius doctor. After a very long time I have come across a doctor who combines excellence, humility, professionalism and empathy so well. I was suggested by a lot of my friends to go for one of the larger known Healthcare mega houses. But after a few interaction with various doctors I knew that I dont want to be at the so-called “C-Section factories”. We had some complications towards the end of my wife’s pregnancy but it was handled very efficiently by her. I’m a resident of multiple countries due to my business and I have option for free healthcare for my family in these countries but I wanted my child to be born in India. I believe there could have been no better choice than Dr. Bedi for this. ***Very friendly sincere about their patient and excellent service.. Dr bedi made me fell very confortable regarding treatment.